Frog and Four Lily Pad LED Lighted 21" High Outdoor Fountain | Fountain City Art Ctr. A perfect tabletop fountain for the indoor and outdoor use. Four lily pads cascade down the gradual decline of a faux stacked rocks. A frog perches nobly at the top. This design comes with an LED light for nighttime use. - 21" high x 13" deep x 12" wide. Weighs 19 lbs. 6-foot long cord. 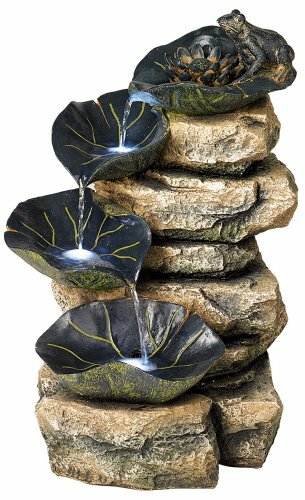 - Frog and four lily pad fountain with built-in LED lights. - Painted rock and lily pad finish. Made from lightweight cast resin; easy to move and positoinj. - For indoor and outdoor use. Perfect for patios or porch areas outside. - Water pump is included; distilled water is recommended with this fountain. One year warranty. 21" high x 13" deep x 12" wide. Weighs 19 lbs. 6-foot long cord. Frog and four lily pad fountain with built-in LED lights. Painted rock and lily pad finish. Made from lightweight cast resin; easy to move and positoinj. For indoor and outdoor use. Perfect for patios or porch areas outside. Water pump is included; distilled water is recommended with this fountain. One year warranty. If you have any questions about this product by John Timberland, contact us by completing and submitting the form below. If you are looking for a specif part number, please include it with your message.